We’re proud to kick off the New Year with the general availability of dcTrack® 6.0.3, the latest version of Sunbird’s DCIM Operations software. 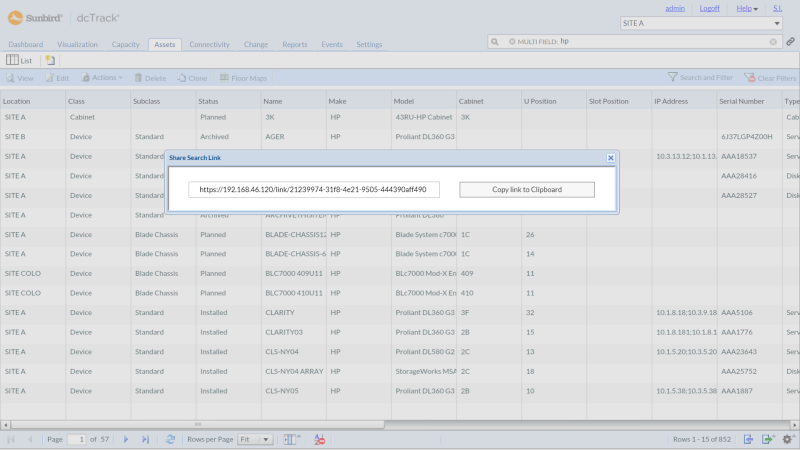 Shareable links in dcTrack 6.0.3 make it faster and easier than ever for data center managers to disseminate information to their teams effectively—regardless of whether they are expert users or are brand-new to our data center management software. Additionally, new API enhancements help users better manage data connections, search results, and custom field picklists. The dcTrack 6.0.3 update is available worldwide on a cabinet/month subscription or perpetual license basis to all customers with valid maintenance contracts. Simply download the update file from Sunbird’s support portal to upgrade today. dcTrack 6.0.3 introduces shareable links for Item Details pages and Quick Search results. Being able to provide a dcTrack user with a link to a specific Item Details page or Quick Search results page can save time and simplify the process of sharing information. With a shareable link, users can copy and paste the link into other applications and share it with their team, without having to explain how to navigate to the specific page or define the exact search parameters. The link obscures any information that may otherwise be included in the URL that is not intended to be shared with all users. dcTrack 6.0.3 introduces REST API Version 2 support to enable fast and easy edits to custom field definitions and associated picklists. You can use this API to create, update, delete, and retrieve custom field definitions and associated picklists as required. dcTrack 6.0.3 provides REST API Version 2 support for tracking connections between end-point devices. This API allows data and power port connections between items to be created, updated, deleted, and retrieved. dcTrack 6.0.3 builds on the REST API Version 2 support for advanced search introduced in Release 6.0.0 that enables you to search for items by specifying search criteria on available item attributes, including via multi-field search. In dcTrack 6.0.3, you can now use attributes to search for a list of items that were last updated on a specified date by a specified user. For more information on what’s new on dcTrack 6.0.3, check out the release notes. Ready to upgrade? Download the upgrade file on the support portal.